I’m really not a jewelry kinda gal. I have a handful of pieces, that I wear to death.. all very simple, very classic… and all have personal meaning to me. I do however, appreciate the craftsmanship… the styles, the colors… but aside from the occasional whim? You won’t find me wearing it. I’d be more comfortable walking around a formal dinner party in a tacky leprechaun suit, then to adorn myself with big necklaces, colorful bracelets, rings and god forbid — insert gagging sound here — toe & ankle jewelry (remember, I HATE feet). Why anyone in their right mind would choose to draw attention to their f… blech. Now, all that being said — I have nothing against folks who love to accessorize, it just isn’t me. In fact, a part of me envies the freedom those women must feel to pull some of the pieces off. 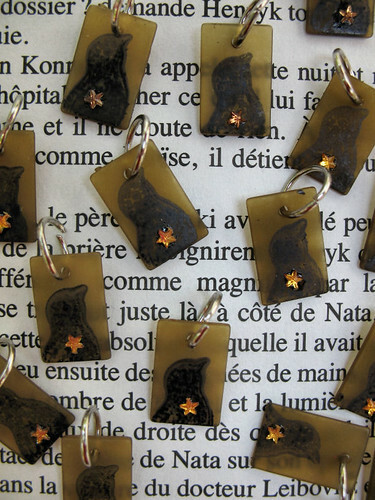 Months and months ago… I stumbled across this blog, where a group of 20 some, talented women & artists created these breathtaking charms.. and when they were all put together? Well the final product just sang to me! Better yet? It brought back a host of wonderful memories along with a flood of ooey,gooey, mushy, sappy emotions.. for a pastime I once adored. 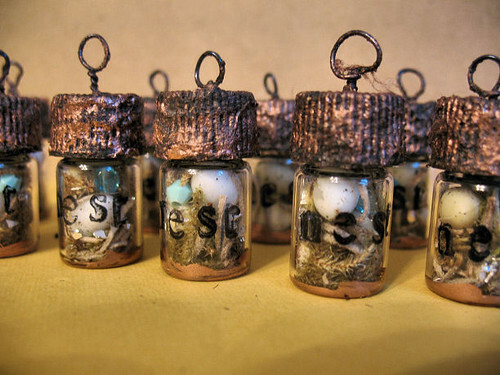 I really don’t know where my passion for small things came from, all I know… is I fall head over platform heels for the tiniest of things — dollhouses & their accessories, charms, seashells, sharks teeth, really…mini anything….. and I always have. Somewhere, I have stashed some favorite childhood charms, well… the ones i didn’t lose anyway. (sorry mom) I just find the small things…and not simply the material objects… the fine details in life, in people… so very fascinating… not many things, can capture my attention more then some small, secret treasure.. that feels as if it is just for me. 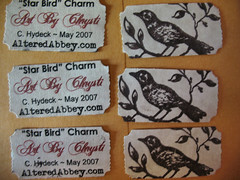 Anyhow — The Just Simply Charming blog more then peaked my interest, it pushed me to try making charms, which I had never really done before. 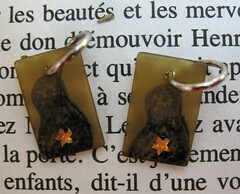 Sure, I have created embellishments, danglies, adornments.. but never one someone may consider wearing! I’ve said it many, many times… I love being pushed outside of my comfort zone – as it truly is the only way you grow. So when the opportunity came up to swap some charms at AAO & at The Embellished Circus… I jumped at the chance! I wanted to keep my bird theme going and present it in a new outlet… a challenge, and neither are quite what i initially envisioned — but what really is? 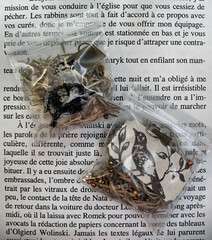 The “Nest” jar charms have mini bird eggs inside of them, silver german glass glitter, and ‘nesting’ materials. 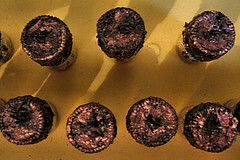 They have faux copper leafing as well. 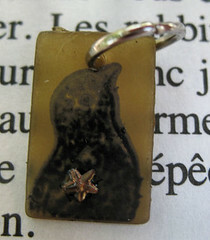 The “Star Bird” charms each have miniature, amber, rhinestone stars. I tried to make the packaging fun as well — I’d love to hear your thoughts! My final attempts, are what you see throughout this post… I’ll be posting tutorials at my site, shortly after it opens…and discuss the pitfalls I encountered along the way. 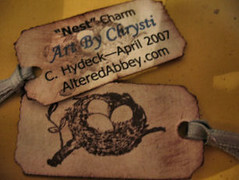 I have a few extras, that I have for sale on Etsy of the “Nest” charms.. 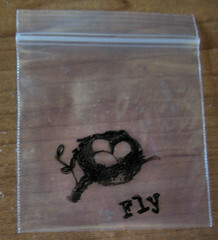 But the star bird ones, have already sold out.. If time permits, I may make some more…let me know if you want them! 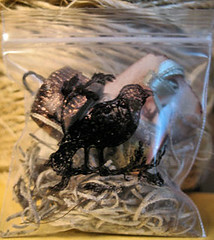 I haven’t received back my charms back from the EC swap yet, but the ones from AAO were amazing! Now, what to do with them all? You won’t find me wearing them… but I will be sure, to properly showcase them — and when I do…y’all will be the first to see! I’m itching to make more — so if you know of any good swaps open, please share! I can’t find your email address. I sent a message through your Altered Abbey site last night, but thought I should let you know in case you do not check that email often. I had a question about your images for sale. Please email me at jrhea@nc.rr.com if you get a chance. They are very pretty. Great job! Your charms are Wonderful. And your new etsy front page kicks! Very nice! !